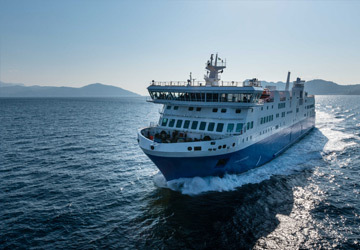 The Bluff Oban ferry route connects New Zealand with Stewart Island. Currently there is just the 1 ferry company operating this ferry service, Stewart Island Experience. The crossing operates up to 14 times each week with sailing durations from around 1 hour. Bluff Oban sailing durations and frequency may vary from season to season so we’d advise doing a live check to get the most up to date information. Bluff is a town and seaport on the southern coast of the South Island of New Zealand. Stewart Island Experience have four daily sailings heading to the country’s southernmost inhabited island settlement, Oban, from the port with journey duration taking just an hour. What should I do in Bluff? What are the transport links like? The town is the southern terminus of the Bluff Branch railway service and lies twenty miles south of Invercargill. It’s also well connected by road with State Highway 1 running straight into the town. What services run from the port? The Port of Bluff provides four daily sailings south to Oban on Stewart Island. The twenty eight weekly journeys are all provided by Stewart Island Experience with the trip taking just an hour to complete.